(Nanowerk News) Biomedical researchers at the University of Arkansas and University of Arkansas for Medical Sciences in Little Rock have developed a special contrast-imaging agent that is capable of molecular mapping of lymphatic endothelial cells and detecting cancer metastasis in sentinel lymph nodes. The new material could be used as a more efficient and less toxic alternative to nanoparticles and fluorescent labels used in the non-invasive, targeted molecular detection of normal cells, such as immune-related cells, and abnormal cells, such as cancer cells and bacteria. Findings were published Sunday in Nature Nanotechnology. Research teams led by Jin-Woo Kim, associate professor in the department of biological and agricultural engineering at the University of Arkansas, and Vladimir P. Zharov, professor in the Winthrop P. Rockefeller Cancer Institute at UAMS, worked with carbon nanotubes and gold. In a previous study, Kim and Zharov demonstrated that carbon nanotubes held great promise as contrast agents for photoacoustic detection and photothermal killing of individual bacteria in blood system. (a) Researches coated carbon nanotubes with gold and applied a cell-targeting bio-agent to deliver to the target. (b) They targeted endothelial LYVE-1 receptors with antibody golden nanotubes to produce photoacoustic and photothermal signals. Developed by Zharov, photoacoustic and photothermal methods deliver energy, via laser pulses, into biological tissue. When some of the energy is absorbed and converted into heat, it expands and emits sound waves. However, the carbon nanotubes had not been fully developed as an imaging agent because of concerns about toxicity. Kim’s research team addressed this problem by depositing a thin layer of gold around the carbon nanotubes. The gold layer enhanced absorption of laser radiation and reduced toxicity. In vitro tests showed only minimal toxicity associated with the golden nanotubes. Compared to existing nanoparticles, the golden nanotubes also exhibited high laser absorption at a miniscule diameter. 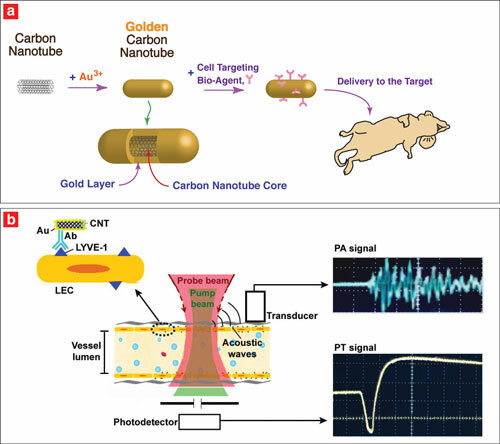 The golden nanotubes required extremely low laser-energy levels for detection, and low concentrations were required for effective diagnostic and therapeutic applications. The synthesis process is simple, inexpensive and environmentally friendly, Kim said. The reaction of the carbon nanotubes and gold chloride occurs in water and happens at ambient temperature. No other chemicals or special conditions, such as heating, are required. In the recent study, the golden nanotubes were used as contrast agents with the advanced imaging methods. The researchers applied the golden nanotubes to solve the challenging biomedical problem of detecting cancer cells in the lymphatic system, which is responsible for the process of metastasis. Specifically, the researchers coupled the golden nanotubes with an antibody specific to a critical lymphatic-endothelial receptor. This enabled the mapping of lymphatic endothelial cells, which line the internal surface of lymphatic vessels. This is important because lymphatic endothelial cells come into direct contact with other cells, such as immune-related cells, tumor cells and bacteria entering the lymphatic system. The specific receptor, known as LYVE-1, is one of the most widely used markers of lymphatic endothelium. Zharov, Ekaterina Galanzha, research assistant professor at UAMS, and other colleagues on Zharov’s team successfully demonstrated the unique ability of the golden nanotubes for integrated diagnosis and therapy at the single cell level. This included targeted lymphatic mapping and the eradiation of cancer micro-metastasis in the critical sentinel lymph nodes, the first lymph node or group of nodes reached by metastasizing cancer cells from a primary tumor. The large surface area on the golden nanotubes may allow bioconjugation, or cooperation, with several biomarkers targeted simultaneously. Absorption can be adjusted for multi-color targeting because the size of the nanotubes can be changed easily by modulating the length and diameter of nanotube core and thickness of the gold layer, Kim said. This advantage may increase the percentage of detectable cells within a targeted cell population and may allow multiple targets to be detected simultaneously. Also, the golden nanotubes’ hollow core could carry therapeutic agents, such as drugs, magnetic materials, ethanol and other chemicals, to further enhance their therapeutic effects. The research was supported by the National Institutes of Health, the National Science Foundation, the University of Arkansas System’s Division of Agriculture and the Arkansas Biosciences Institute. Kim works in the Institute for Nanoscale Materials Science and Engineering at the University of Arkansas and directs the Bio/Nano Technology Laboratory. Zharov is director of the Phillips Classic Laser and Nanomedicine Laboratories at UAMS. In addition to Kim, Zharov and Galanzha, other authors of the paper include Evgeny Shashkov, visiting scholar at UAMS, and Hyung-Mo Moon, postdoctoral associate at the University of Arkansas.